The beautiful thing about online poker and live poker, too, is that you’ll see a healthy mix of players no matter what type of game you’re playing. Whether you’re sitting in the WSOP Main Event or a $1/2 cash game at a small casino in Europe, chances are you’re sitting down with a bunch of new players. With some keen insight, you can make a lot of money playing against them. Today, we’ve got some smart poker tournament strategy tips you can use when you play online poker or live. There are lots of different types of poker players, but in their most basic form, they can be slotted into two different categories. There’s the absolutely careless and the absolutely scared. A scared player won’t hesitate to call, but he seldom raises. And if he is faced with a raise, he’ll fold like a cheap chair. Careless players, on the other hand, will really do anything to mix things up. They’ll make wild bets, call anything, and raise without a care in the world. The poker strategy you use should be adapted base don the player. If you’re playing against a player who is scared, bet aggressively in an effort to chip away at their stack. You should also be mindful of their raises. It’s usually an indication that they have something. If you’re facing off against a careless player, we recommend value-betting any strong hand you’ll holding. If you’ve got big pairs, it should be relatively easy to call down large bets. New players tend to shy away from betting if they don’t get the hand they want on the flop. 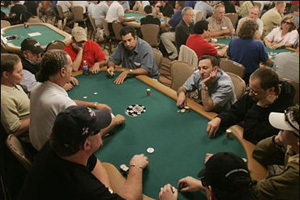 After all, watching poker tournament strategy on TV has taught them that you only ever play Aces, Kings, other meaty pairs, or two super-high suited connectors. But the thing about TV is that a lot of play ends up on the cutting room floor. Lots of mediocre hands are played and people do make money playing them. New players will rarely bet after the flop if they don’t get a good hand, so you can use this to your advantage by betting. OK, so this poker cash strategy doesn’t really work online, but if you’re like a lot of players who play online poker and win your seat to land-based events, this definitely applies. Body language is a big deal in terms of reading players. Usually, watching for patterns can help you predict the cards a player is holding. Reading tells does take a lot of practice and keen observation, but there is something simple to look for that can help you go a long way. A player who constantly checks his hole cards is likely confirming the suits of his hands. You can use the player’s lack of confidence to your advantage. If you want to put a poker strategy you learned here to the test, review the sites you see right here at PlayOnlinePoker.com. Many of the options even hold freerolls and free games, so you can play without risking real money off the bat. Be mindful, though, that the free tables usually have the most newbies, so playing small stakes poker might be a better bet.